A comprehensive survey conducted (2008-2009) by the JDC International Centre for Community Development (ICCD) among Jews in five Eastern European countries provided data on Jewish background and current attitudes of young adults. Based on this data, a comparison is made of young adults who are alumni of Jewish summer camps and those who did not attend summer camp as youth. 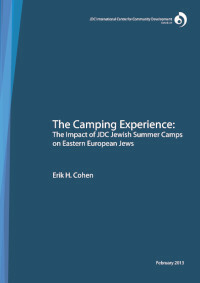 Campers express stronger Jewish identity as young adults, as documented through a number of indicators related to religious practice, Jewish Peoplehood and attachment to Israel. The impact of Jewish summer camps is particularly clear among campers from weak Jewish backgrounds.